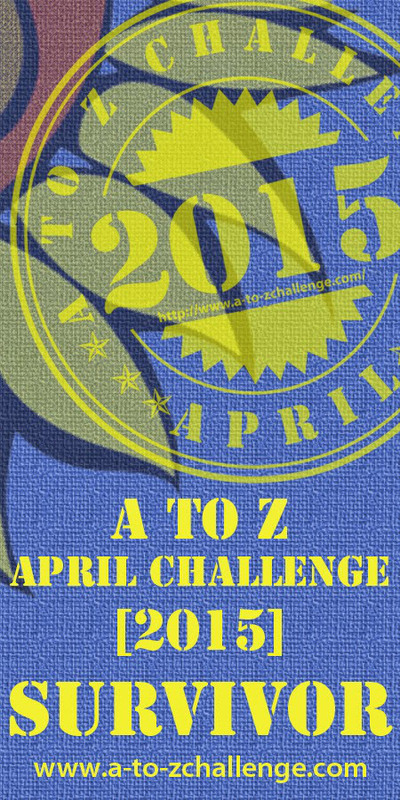 Now that I’ve had the weekend to recover, I thought I’d post my reflections on the April A to Z Blogging Challenge. This was my first time taking the challenge, and I learned a lot from the experience. I’m glad I prepared most of my posts ahead of time. As someone who normally blogs once a week, I don’t know how I would have survived writing a post every day. And if I had managed it, I definitely wouldn’t have had much time to visit other bloggers. Even with all my preparation, I found that I couldn’t do everything I wanted. I’m a firm believer in responding to all of my commenters (and I am certainly thankful for all the comments I received! ), but this left me with limited time to read other posts. For those of you who wondered where I went to, I am now catching up! If I do this again next year, I will be sure to write all of my posts ahead of time. I’m thankful that most of my posts were based on suggestions from my readers. This kept me motivated to write my posts, since I knew at least one of my readers would be interested in the rogue word of the day. It also helped me to channel my imagination and come up with defined ideas because I was starting from a specific word prompt. For anyone interested in taking up this challenge for next year, I recommend having some kind of theme. The most troublesome aspect of this challenge was trying to interact with bloggers on other blogging platforms. I found myself getting annoyed by CAPTCHA because I kept having to prove I wasn’t a robot. Then when I left a comment, there was no easy way to find out the response to it, short of coming back to the post or asking to be notified via email. I’m sorry, but my email is full as it is. So I feel I missed out on some chatting with non-WordPress bloggers. If someone else has a suggestion on how to manage this interactivity issue, I’d be happy to hear it! The best thing about doing this challenge (other than the personal sense of accomplishment) was getting to meet some great new bloggers and read their posts. I was amazed by the variety of topics and the amount of effort my fellow bloggers put in to their posts. During April, I visited all sorts of wonderful places. I experienced life in Japan and found out how to interpret kanji characters. I toured through Glasgow and New Zealand. And I learned about the experiences of women living in India. I also went back in time to celebrate the Roaring Twenties in America and to salute the bravery of those who lived through World War II. I read lots of fiction as well, including an ongoing mystery story, flash fiction using odd words, creative stories from childhood, and a series of stories inspired by types of trees. I got my sci-fi/fantasy fix, too, by reading philosophical discussions about science fiction, discovering comic book characters, and assessing the merits of sword and sorcery movies. I even found a fabulous blog series that is chock-full of useful writing tips. I could go on and on…but then the word count of this post would really push the limit! Congratulations to all of you who made it through A to Z. And thank you to everyone who helped make this a positive experience for me: host Arlee Bird and his many helpers (especially John Holton, who helped me on my way), my fellow A to Z bloggers, and all my readers and commenters. And to my son, who inspired me and who drew this wonderful tribute to the challenge. We will now return to Sue’s regular posting program…see you all next week! I so agree with the cross blog platform. 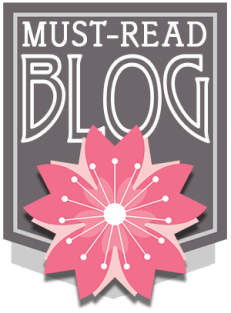 I had a hard time commenting on blogger blogs, and I thin ended up not reading a lot of those due to that. Like you, I did not like the idea of subscribing to comments. On the other hand, commenting on wordpress based bogs was really easy. Hi, Solveig! Thanks for visiting my blog. Yes, I find commenting is so much easier on the WordPress-based blogs. I’d really like to find a good solution to this one. Take a look at a response I got on my reflection post about cross platform. I wonder if it is the answer to your problem. Thanks, Maryann, I’ll come by and take a look! It turns out I can read the other platform blogs in the reader but I couldn’t comment nor even click on it to go to the other platform. Someone just told me to check out feedly and a place to read all blogs I follow in one place. I’ll look at Feedly, thanks. I’m sure there’s a way of managing all this, we just need to find it! Great post, Sue! Sounds like you rose successfully to the challenge–the daily posting sounds tough! I love your kiddo’s art–looks like he gets his imagination honestly. 🙂 I’m glad you posed the cross-platform question; this drives me nuts, too. Glad to hear I’m not the only one with this cross-platform issue. That means there’s probably a solution somewhere! Thanks Sue of the mention. I agree, having a theme makes it easier to keep going. You’re welcome, Rhonda! I really enjoyed your pics of New Zealand. I don’t know what I would have done without a theme. Too scary to contemplate! About commenting on other platform, yeah that’s annoying sometimes. I usually just leave name, email, and url, but I won’t get notifs if they reply. I don’t bother checking my email haha. Some articles I read suggest to make open id to comment to other platform, but idk I’m not interested. Thank you. And you’re not a lazy person, you are just busy! 🙂 I’ll have to look more into Open ID, but I don’t know if that would work for me, either. I’d rather not have more IDs registered out there than I need. Hey Sue, I think we followed mostly the same blogs 😉 But you still managed to find some I didn’t know. Must visit! Keeping up with comments was hard for me too. I made a point to reply to all comments on my blog and to return all of them, but having to write a good part of the posts too took up a lot of time. Next year, I want to be really ready, I mean, having all posts ready to go when the challenge starts. Networking during the challenge is fantastic, I enjoyed it a lot, but I think a part was lost to me because of time. But I still managed to met a lot of nice people writing truly great blogs. And this is a win! Thanks, Carrie. That was great to see serendipity in action. 🙂 I appreciate all your comments on my posts, they really helped keep me going! I love your son’s contribution to this post! Congrats on finishing! I loved your series. Most of my posts were written ahead of time, but I think next year I’ll be even better about that. I always plan to pre-write, but so far always end up with having to keep up as I go. I love your son’s drawing. Hi, Kristin! Thanks for stopping by my blog. Somehow our best-laid blogging plans never seem to work out, do they? Hopefully we’ll both do better next year. And thank you on behalf of my son! I had a blast this challenge, and your posts were ones I checked out daily. I even have one bookmarked because I know I will forget the information and it's something I always question. I have just come to the same conclusion! WordPress is hands down the better system for comments. I feel bad for all the Blogger people, I must have had Blogger eat at least 20 of my comments this month. Your son’s picture is adorable. Congratulations on a great challenge theme. Hi, Robin! Thanks – I’m happy you liked the theme, especially when yours was so wonderful. I learned a lot of tips from you and Heather – I’m so glad I found your blog through this challenge! Your son’s drawing is great! Thanks for the mention. It seems the commenting problem is universal – I’ve read it in so many posts now. I wish I knew the answer! I’m constantly amazed by my son’s spontaneous creativity. I’ll let him know you liked his picture. 🙂 And you’re very welcome for the mention – I loved getting the chance to find out more about Glasgow. What a great city! That is an adorable picture. The different blogging platforms seems to have been an irritant for many participants. Congrats on finishing. Thanks, Susan! Yes, it’s apparently a common problem. Grand set of lessons to draw. Now I am considering doing an a-to-z thing for my mathematics blog. Go for it, Joseph! It’s been a fun structure to work with. Well, this is embarrassing, but after reading your post about cross platform woes I’m thinking, “Isn’t it the same for WordPress?” when lo! I see up on the page the “Reader,” click on it and everything’s laid out all nice and neat. Groovy. I don’t have that little button on my blog though, so I have to go to that page directly (which, let’s be honest, I’ll never remember to do). My blog is self-hosted though, and not WordPress hosted. I wonder if that makes a difference? It depends on your site. If I leave a comment on your blog and you have Jetpack, I’ll get a notification on my top bar that you did so…. Some newer themes even have a full-service WP.com commenting section, which means no more filling out forms, ever! Ooh, I want to know what those themes are, with the full-service commenting section. Is there a specific tag for that in the theme descriptions? You’re right, even WordPress has its quirks. I am on WordPress.com, which doesn’t integrate well with WordPress.org. Self-hosted probably makes a difference, too. I don’t get any kind of automatic notification for your comments, but I get it from other WordPress blogs on .com. I agree about the Cross-Platform trouble. I have an account on Blogger, but it doesn't help. The only way to get notifications is to 1) check the post yourself, or 2) sign up for notifications…. so that is very annoying. Google doesn't really take care of the platform like it should. 😦 I wish I could just convert everyone to WP, haha. I love M for Mom, too. Wasn’t expecting that one! As a reader I found reading this challenge so much fun and informative! I appreciate that you always answer all of you comments; makes it an interesting conversation! Looking forward your weekly post and will be reading some of your interesting blog suggestions you mentioned in this post. Thanks, Nicole! I enjoy our conversations. 🙂 I hope you find some great new blogs to read! Thanks for all the tips, Liz, I really appreciate it! That’s so weird about the browser issue, I never would have guessed that could happen. I use Firefox and so far haven’t run into any problems. 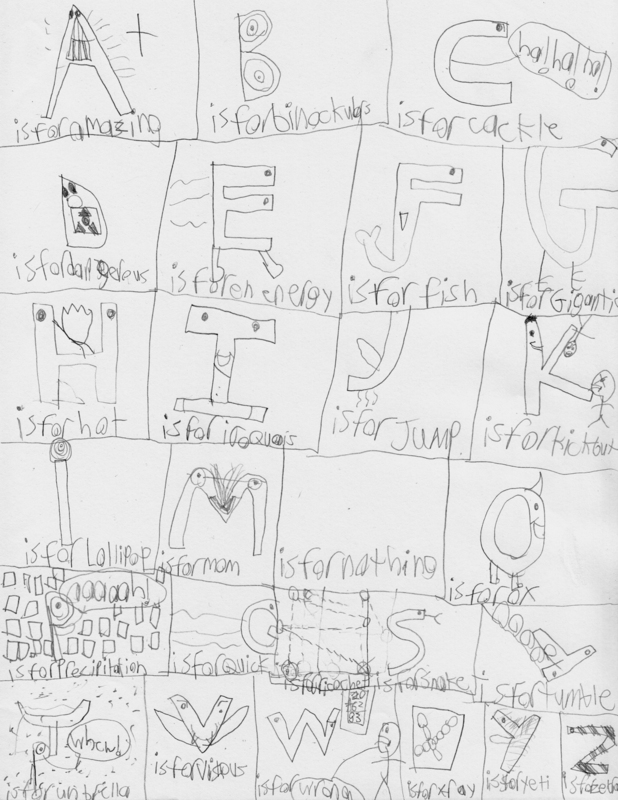 My son will be excited that you liked his ‘nothing’ drawing – that was one of his favourites. 🙂 Thanks so much for commenting! I glad you had fun! And thank you for the great reflection post, I’ll have to check some of those blogs out too! I visited around, but it seems like I still missed a lot… 🙂 Cheers! Congratulations! What a fantastic accomplishment – I very much enjoyed your posts, and you’ve inspired me to want to take on a blogging challenge. It’s great, isn’t it? I guess someday he’ll be taking up his own blogging challenge. 🙂 Looking forward to seeing your posts if you do! It’s such a great idea to have based your posts on reader suggestions – it means that extra bit of reader involvement which is awesome. I loved your posts, you did such a great job with it. And honestly that were/was post is still with me, I was reading yesterday and pounced on a ‘were’ to test your theory and it totally works. I’m honestly so pleased with this added bit of knowledge. I didn’t post on the cross blog platform issue this year, but both this year and last year it really bugged me. I agree, I don’t want my email clogged any further than it already is, so there’s no good way to interact with non wordpress readers. It does mean that I steered very much towards WordPress blogs this year which seems like such a shame! That’s great that the were/was post is working in ‘real life.’ 🙂 Glad to add to your stores of knowledge! I really hope someone comes up with a cross-platform solution, because it is a shame to feel limited to interacting with WordPress blogs. I keep thinking that someone must have come up with a tool – I guess it’s difficult when you’re dealing with code from different companies. Congrats! I enjoyed your posts and only wish I had got to more. I would totally follow your son’s posts if he had posted on those! I found some cross platform issues. As a Blogger blogger, the main bugbear was filling in my name, email, URL to comment as I’m not on Disqus and other things. But it’s minor gripes. I had a blast this year. I so agree with you about the cross-platforms. I especially HATE captcha and blogs that force you to post your comment publicly on google + or facebook. Congrats on completing the A to Z Challenge! Looking forward to next year! See you on the Road Trip! Hi, Mary! Thanks for stopping by and commenting. Yes, having to post your comment publicly everywhere is just pushy. Personally I am gratified by every comment, and would never dream of making my readers uncomfortable in making them. Congrats to you as well, and I’ll definitely see you on the Road Trip! And your son’s drawing is the cutest! I love that you’re so thorough with your adventure, Sue. The fact that you planned ahead, made it through each day successfully and then reviewed the entire experience is hugely admirable (not to mention helpful to other bloggers who want to take on the challenge next year). You, as always, are a wealth of information. And many thanks for the terrific links to so many bloggers. A buffet of beauties to explore. Congratulations on a magnificent job. And kudos to the kiddo for his deft artwork! Thanks, Shelley! It certainly was quite the experience for me. I will be sure to pass along your compliments to the kiddo! Congratulations on making it to the end. I don’t know a good way around the cross platforms on here. I just make sure I put my URL in the signature on non-Blogger posts so that you guys don’t have to jump through hoops to find me! Hi Sue! I love your son’s drawings! Very creative. I agree the cross-platform commenting was a pain. I hope someone can figure out a way to make Blogger and WordPress play more nicely together. As you said, having your posts written ahead of time is key. I hope one of these times, I’ll actually be able to do that. If you like mysteries, you should check out the A to Z murder mystery at http://www.athertonsmagicvapour.com. It was very well done, and Melanie even used theatrical makeup to disguise herself as each of her characters. Just awesome. Thanks for the recommendation, Lori! I’ll be sure to wander that way during my post A to Z road trip. My son’s drawings are such a highlight for me, I just had to share this one. 🙂 Glad you enjoyed it! I moved my blog to WordPress because of the comment issues. The CAPTCHA is more than annoying. I missed your A-to-Z posts but I’ll try to catch up and I’ll be here next year. Thanks for coming by, Dan. Glad to hear I’m not the only one who hates CAPTCHA. I feel like I missed a lot of great posts during A to Z – there just wasn’t enough time to explore everything. Looking forward to reading more of yours! Thanks for following. I am going to try the A-to-Z next year, but I’m taking as much of your advice as I can. I followed 6 or 8 people this year and it was a lot of reading. I still haven’t written the follow-up post I was planning. You’re welcome! I found it hard to keep on top of all the reading, too. I wanted to read all the posts written by everyone I was following, and it just wasn’t possible. 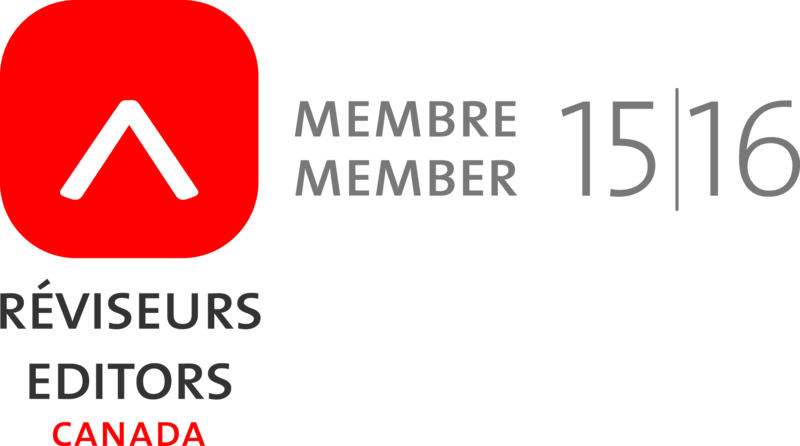 I’ve signed up for the A to Z Road Trip to remind myself to visit other blogs over the next few months and read them at a more relaxed pace.